Circ.Br is a prospective, longitudinal study of patients with high grade-breast tumours. The primary aim is to detect biomarkers circulating in the blood that are indicative of recurrence/relapse before it is symptomatic. Earlier detection of treatment resistance will allow therapy to be adjusted while cancer deposits are still small and manageable, and minimise exposure to treatment side-effects in patients who are unlikely to benefit. The ultimate goal of this study is to develop a minimally invasive ‘liquid biopsy’-based diagnostic test, but we also hope to identify new drug targets, and understand the genetic changes that underlie breast cancer progression (infographic below). This is a collaborative study, bringing together several clinical disciplines (including surgery, radiology, pathology and oncology) as well as translational research groups. Patients with high-grade breast cancer are currently being recruited through the Royal Brisbane and Women’s Hospital, and their progress is then followed by the Circ.BR team for as long as possible up to five years. Participation in a lifestyle and well-being questionnaire. *tissue in excess of what is used in normal clinical diagnostic testing procedures. In Australia, around 20% of breast cancer patients experience disease recurrence. Once breast cancer spreads to distant sites and establishes new secondary tumours (mainly the liver, lungs, bone and brain), treatment options become very limited. Combination treatments will be used to simultaneously target tumour growth and likely resistance pathways. There is a huge, ongoing international effort to realise this goal, involving drug target discovery, therapeutic development and clinical testing of new agents. Researchers are constantly striving to increase the efficiency of this process – one approach is to improve access to human tumour samples for research. At the moment, breast cancer metastases are not routinely excised or biopsied - these invasive procedures are only performed if there is proven benefit for the patient; but paradoxically, efforts to discover and test the benefits often require tissue samples. In the past this dilemma has significantly limited the development of new treatments. Detailed molecular comparison between ‘matched’ primary and metastatic tissue samples (i.e. from the same patient) can illuminate the changes that facilitate disease spread, as well as those that render the tumour sensitive or resistant to particular therapies. Another cutting-edge application for these donated tissue samples is cancer drug screening in Patient Derived Xenografts (PDX– see infographic below). The MBP team and the Brisbane Breast Bank comprise the Brisbane node of an NBCF-funded rapid autopsy study called BROCADE. Led by Profs Robin Anderson (Peter Mac, Victoria) and Alex Swarbrick (Garvan Institute, NSW), this 5-year initiative aims to provide resources to accelerate the development of new therapeutics, and predictive biomarkers that will identify the most effective treatments for each patient. BROCADE will establish a biobank of tissues patients who consent to a rapid autopsy in the event of their death from breast cancer, and donation of tumour samples for research that will benefit future generations. PDX will be established as part of this resource. Tissue and data collected will be part of a resource for researchers nationally and internationally, subject to ethics approvals. BROCADE is currently recruiting. Patients interested in participating should discuss this with their families, support network and doctors. For more information please contact Amy Reed. Oncology R&D is flourishing at the moment, yet molecular-targeted agents are still not routinely used to manage metastatic brain disease. Historically, a heavy co-morbidity burden and misconceptions about added risk of toxicity restricted their participation in clinical trials, but this trend is beginning to change. An increasing number of clinical trials assessing the intracranial efficacy of molecular-targeted agents are being registered. Many are testing monoclonal antibodies (mAbs) that target human epidermal growth factor receptors (HERs), which have been strongly implicated in the risk of metastatic outgrowth in neuregulin-rich brain tissue. This reflects the urgency of the public health problem and is a promising sign of healthcare reform. Brain metastases are highly vascular, so their recalcitrance to circulating therapeutics (particularly larger drugs like mAbs) has been mainly attributed to intrinsic resistance and restricted uptake across the blood-brain-barrier. But emerging data suggest a more complex scenario in which drug bioavailability is also restricted by oedema, chaotic vascular perfusion and abnormal interstitial fluid dynamics. Paradoxically, these factors can create areas of sluggish blood flow and hypoxia in an otherwise hypervascular tumour. 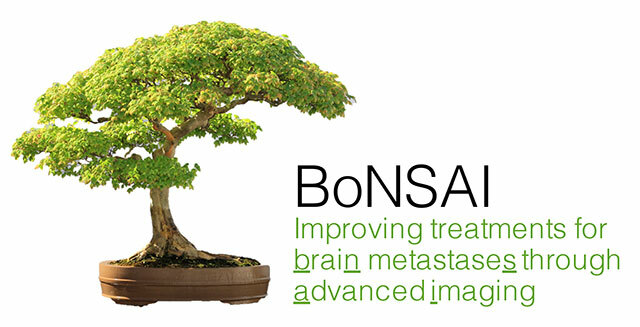 BoNSAI is a cross-sectional, observational clinical trial. Patients participating in this study will be administered with a small dose of 89Zr-pertuzumab tracer, then imaged several times over the following week to determine the uptake and retention of the tracer in brain tumours over time. The study aims to establish guidelines to predict which patients will benefit from HER2-targeted therapy, and around mAb dosing schedules for treatment of metastatic brain disease. For more information please contact Jodi Saunus. Improvements in breast cancer survival are attributed to earlier detection through regular mammograms and improved treatment options. Currently, seven women die every day from breast cancer in Australia, and UQ’s Advanced Breast Cancer Research Team is at the forefront of the effort to reduce this number.